[Le Mars, Iowa, USA] – Not too many dancers at Central Dance Academy in Le Mars need to think about balancing dance lessons with football practice, [but that’s] what Dylan Carlsen did this fall. Dylan, who turned 12 Nov. 2, has been dancing since he was 3 years old. He is a sixth grade student at Le Mars Community Middle School. 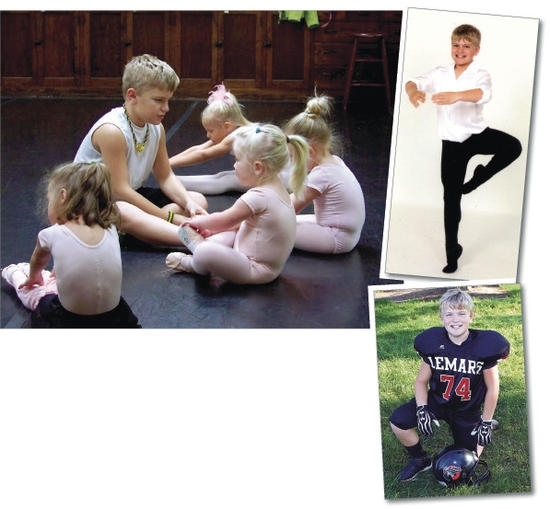 Dylan, the son of Karen and Doug Carlsen, keeps a busy schedule of dance lessons and sports activities. “I think he likes dancing more than his sisters did,” said Karen. “It conditions you. Dance gives you endurance and flexibility, and it strengthens your legs,” Dylan said. 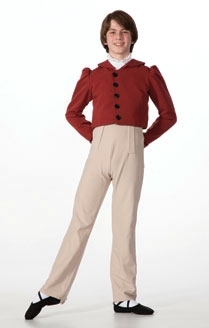 [Torrington, Connecticut, USA] – A charming 9-year-old boy walked into the Nutmeg Ballet Conservatory for the very first time this past week. He was wide eyed and a little nervous as his parents explained to Mrs. Marjorie Dante, the Torrington School of Ballet registrar, that their young son was interested in taking ballet lessons. After a nice chat, he and his family had the opportunity to peek in on a class. He saw the young men of Nutmeg’s Pre-Professional Summer Program leap across the studio with a strength and agility seemingly possessed only by superheroes. And that was it. He was ready to take the leap too. This is where it all begins. It’s that spark of curiosity that is all too often hidden away, particularly when it comes to young boys, that is nurtured at The Nutmeg Ballet. Whether it’s a child of 9 at TSOB or of 14 at The Nutmeg Ballet, the methodical training places these ambitious children on the path to some very amazing places. Take Nutmeg alumnus Martino Sauter, for instance. 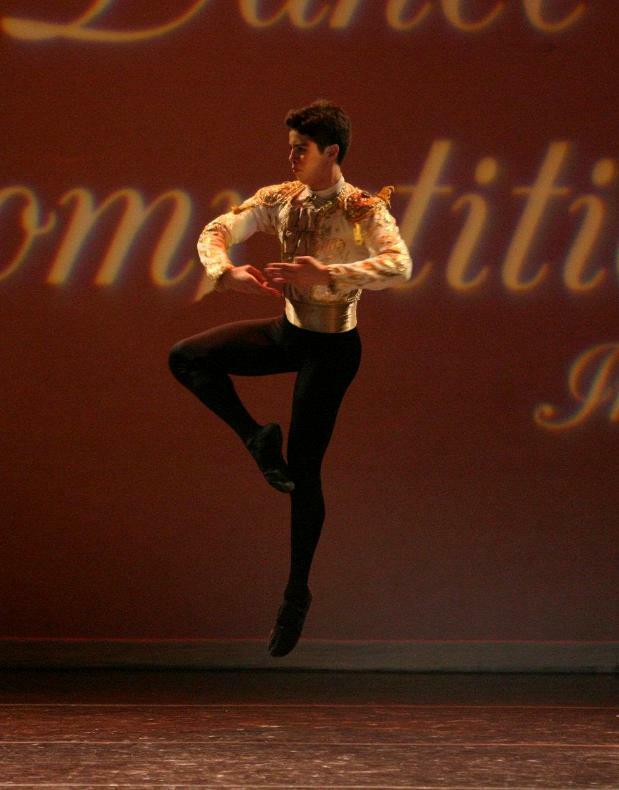 He came to The Nutmeg Ballet in 2010 and graduated from the Professional Two Year Program in 2012. Now a dancer at MOMIX, Sauter founded the social networking sensation “boys of ballet” in 2012 with the goal of placing the spotlight on male ballet dancers through breathtaking images shared on Facebook, Twitter, Instagram (@boysofballet), and on their website, boysofballet.net. The “boysofballet” video on YouTube has already been viewed by thousands and their sites receive hundreds of submissions a day from across the globe. Efforts to “celebrate the power and agility of the male dancer” have already garnered the attention of dancers from Boston Ballet, The Royal Ballet, ABT, NYCB, and even a nod from David Hallberg, the famous Bolshoi Ballet and ABT principal dancer. In addition, Sauter and his colleagues are busy developing a line of male dancewear and accessories including a “boys of ballet” shirt available for purchase at The Dance Shop at The Nutmeg. “I wish someone had told me that ballet was an option when I was growing up. That it was something boys could do and that with the right training and lots of hard work, boys can be successful. Ballet is not just for girls, it’s for everyone,” elaborated Sauter who has been invited to numerous ballet schools to enlighten and motivate young boys interested in pursuing ballet. So, why should boys consider training in classical ballet? Ballet training develops agility, creative thinking, discipline, and a work ethic that translates into success in any field of study. And if that weren’t enough, more and more athletic training programs are turning to ballet to increase coordination, flexibility, strength, precision, control and stamina. Numerous professional athletes credit their athletic success to ballet training and considering the benefits to range of motion, speed, and balance, this isn’t surprising at all. 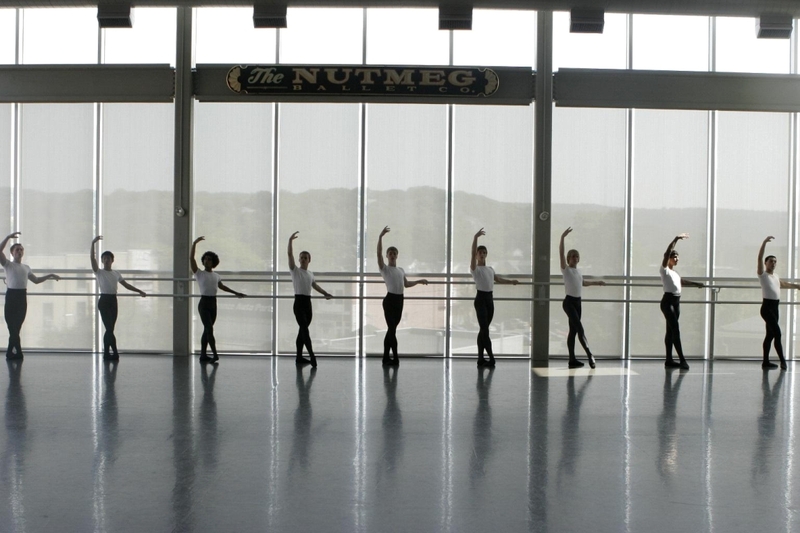 Many Nutmeg Ballet students were accomplished athletes who traded it all for the discipline of ballet. Ben Youngstone of Richmond, Virginia, was a talented baseball player; Thel Moore of Baltimore, Maryland, was once an accomplished track star; and Matanya Solomon of Fairmont, West Virginia, was a competitive swimmer, for example. This fall, Torrington School of Ballet will introduce a new boys-only ballet class taught by Nutmeg’s Ballet Master, Tim Melady, targeted to boys ages 8 and up. “As in other sports, a dedicated practice of ballet builds strength, coordination and confidence. Balletic exercise tones muscles and improves physical intelligences while studying among peers will foster camaraderie and a friendly competitive spirit,” Melady said. And if that’s not enough to convince you that ballet is for tough guys, remember that even Batman does ballet. Christian Bale, the actor who plays the strapping superhero, studied classical ballet as a young boy. And just look where he ended up. For information regarding the Nutmeg Ballet Conservatory and Torrington School of Ballet, please visit nutmegconservatory.org or call 860-482-4413 extension 301. Registration is held every Thursday from 4-6 and Saturday 10-12 throughout the summer at Nutmeg Ballet, 58 Main Street or at the Nutmeg Dance Shop, 61 Main Street. [Kansas City, Missouri, USA] – The musical Billy Elliot, which won ten Tony Awards in 2009 and comes to Kansas City’s Music Hall next week, teaches that to move toward a dream, the dream must involve movement. With music by Elton John, it’s the story of an 11-year-old boy who gives up boxing for ballet, much to the chagrin of his father and brother, both ensnared in a British miner’s strike. Yet the issues and passions stoked by the show are not unfamiliar to young male dancers in Kansas City. To meet the emotionally and physically bruising demands of playing the title character in the musical about an 11-year-old’s determination to convince his world that it’s okay for him to dance, the North American touring company divides the eight-shows-a-week performance schedule among four young dancers. The show’s resident choreographer, Adam Pelty, says he works with the kids every day in every city to keep the experience raw for both dancer and audience. Like Billy, it seems every young male dancer has overcome a litany of objections and stereotypes about boys and ballet. Twelve-year-old Shawn Kramarovsky says that his love of dance negates any disapproval he’s been subjected to. “When he wanted to dance ballet a year and a half ago, I tried to bring up different reasons why certain people wouldn’t accept you. Because I’d heard about other boys bullied at school. I was kind of afraid,” she recalls. While Shawn arrived at ballet from ballroom dancing, eleven-year-old Ocea Thompson came at it from another angle completely – his interest in sports – and is asked what ballet offers that could help him in sports. Ocea eventually reported to his mother, Tiffany Thompson, another benefit of ballet that any mother of an 11-year-old boy might aspire to achieve – it made him feel calm. He saw Billy Elliot in New York and says he relates to the show’s young protagonist. Alex Estrada was a baseball player who got dragged along to his sister’s ballet classes. With Alex’s dad deployed in Iraq, his mom toted her four children to all of their extracurricular activities. Alex, then 8 years old, would wait with his mother in the studio at The Dance Center — a private studio at the corner of Bloomingdale Avenue and John Moore Road — while his younger sister Shaelynn danced. He watched the advanced ballet classes and eventually joined a boys’ sports jazz class. The teacher, a professional dancer with the Sarasota Ballet, showed him the steps and athletic ballet moves he was working on. Within four months, the tall and athletic boy from Riverview — who already had junior-high school baseball coaches asking where he was playing ball the following year — begged to take ballet lessons, said his mother, Monica Estrada. At first, baseball and ballet coexisted in Alex’s life. Alex discovered a love of dance and started training at The Dance Center with his sister, who began classes there eight years ago. He kept playing baseball, too – a mark of pride for his father, Army Reserve Capt. Jesse Estrada. Eventually, though, he felt pressured to make a choice. His dance teachers wanted him to pursue dance. His coaches and teammates wanted him to give his all to baseball. “Being 10 years old, doing ballet and baseball, I was getting picked on, and sometimes we got into little fights on the team,” Alex said. “Not anything bad or serious. Once his teammates saw the girls he got to dance with, they came around, too. Another pressure was Alex’s dad. A year into dancing, and after five years of playing baseball, Alex traded in his cleats for ballet shoes. 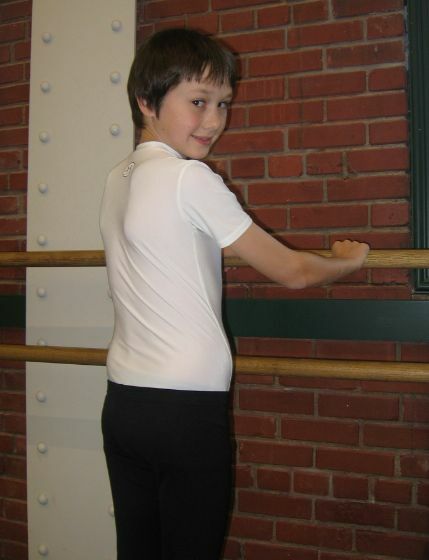 Visualizing his future helped Alex choose ballet. “With baseball, everything’s going to stay the same,” said Alex, now 15. “It’s always going to be, like, a home run, an RBI, you run to the next base, catch another ball, run the ball, whatever. These days, Alex and Shaelynn, 12, each dedicate about 25 hours a week to dancing. This summer, Alex and Shaelynn’s passion for ballet is taking them to study with top-level dancers and instructors. Alex won a full scholarship to the prestigious Joffrey Ballet School in New York City, where he will take part in an eight-week intensive classical ballet workshop. He turned down a full scholarship with the Orlando Ballet to study at Joffrey. After New York, Alex will participate in a three-week summer program at the Carreño Festival in Sarasota – all expenses paid. Shaelynn has partial scholarships for summer intensives at the Orlando Ballet School and the Carreño Festival. Alex’s sister almost joined him in New York this summer. The Ajkun Ballet Theatre offered her a scholarship for a competitive summer session – she was one of 20 invited out of 2,000 candidates. But the family turned down the offer because the program is geared toward older dancers. 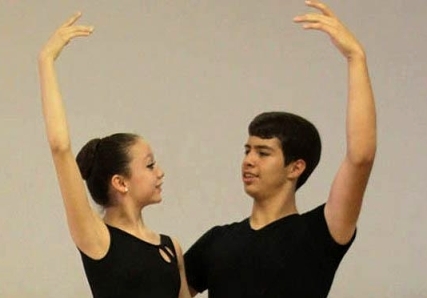 The Estradas’ dancing caught the eye of scouts for professional companies at the 2012 Youth America Grand Prix semifinals in Tampa and the 2012 American Dance Competition in Orlando. Both finished in the Top 12 of their divisions in Tampa, and Shaelynn finished in the Top 15 in Orlando. Shaelynn is looking forward to spending the summer with other ballet students and learning from notable dancers such as Joseph Gatti, a principal with the Boston Ballet. “He’s really good,” she said. Recently, Alex and Shaelynn began working together on a “Don Quixote” ballet pas de deux – a dance for two people. The routine incorporates promenades, lifts and jumps and requires each to rely on the other’s strength and skill. Alex and Shaelynn aspire to dance professionally and plan to postpone college. Alex’s peers still tease him a bit about wearing tights and dancing, but he shrugs it off. He doesn’t have much time for friends, anyway. “Most of the time I’m in the studio working,” he said. “This is really what I want to do when I grow up. I want to be able to dance like Carlos Acosta” – the Cuban-born dancer who is a principal guest artist for the Royal Ballet in London. A photograph of a male ballet dancer soaring through the air stirred a desire in a then eight-year-old Braden Falusi to sign up for his first ballet class. Falusi, now 14, is still dancing at the school, but there aren’t many others like him. Boys doing ballet is not a common sight in Canada, especially Alberta, says the school’s artistic director, Murray Kilgour. There are just five boys enrolled in the school’s professional division compared with 95 girls. But according to the school, it’s time to wipe the stigma of male ballet dancers off the dance floor. The school is launching a free, boys-only ballet program this spring to encourage boys to take a break from shooting pucks and have a go at plies and pirouettes. The program, geared toward dancers between the ages of eight and 11, gives boys a chance to see if they like dancing without committing to a full, year-long program. The hope is that they will stick with it in the future, Rusak says. The concept of professional athletes trading in their skates or sneakers for a pair of ballet slippers is not a new phenomenon. “A lot of hockey players and professional athletes have used ballet training to increase flexibility, strength and endurance,” Rusak says. For instance, during the 2011 National Basketball Association lockout, forward Michael Beasley of the Minnesota Timberwolves decided to skip the bar, instead taking to the barre, to help build a stronger, more limber body during the off-season, the Minnesota Star-Tribune reported last October. Also on the list of professional athletes who once ditched their jerseys for leotards include former NFL players Lynn Swann, Herschel Walker and Barry Sanders. Kilgour isn’t surprised that so many professional athletes have improved their physical abilities through ballet. While girls are taught the elegance of standing en pointe, using specially reinforced pointed ballet slippers, “boys don’t do that,” he said. Among Kilgour’s students while teaching at the Royal Ballet School was a boy from Yorkshire, in northern England, whose perseverance to study ballet against the odds inspired the Hollywood film, Billy Elliot. 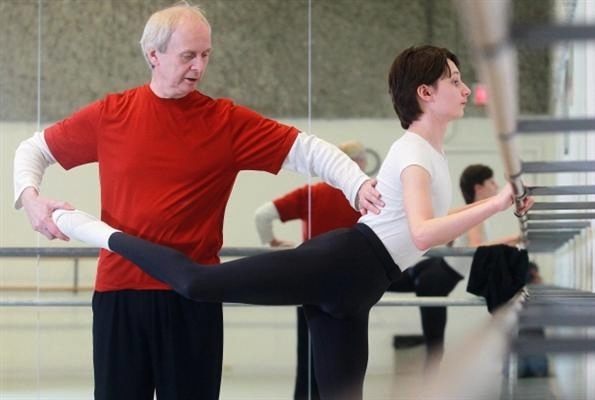 After that first class, there was no looking back for Quinn, who will be studying this summer at Montreal ballet school, L’Ecole superieure de ballet du Quebec. Quinn started ballet at 11 at the School of Alberta Ballet, but now takes private lessons so he can also focus on other pursuits, like drama. And if the many benefits of ballet weren’t enough to persuade more boys to try it, Braden adds there’s always the perk of being the single boy in a sea of girls. “Do you meet any hot girls there?” is a question Braden said he often gets from friends at school. For more information about the School of Alberta Ballet’s free Introduction to Ballet program, visit schoolofalbertaballet.com or call 403-245-2274. The program runs Saturdays from April 14 to May 26. ASTON Villa’s next generation of stars learned silky new moves when they took tips from Birmingham Royal Ballet dancers. Members of the under-15s squad teamed up with ballerinas and male dancers to learn skills which could be pivotal to their development as footballers. The masterclass was organised as part of an ongoing partnership between the two organisations, with the football club keen to adopt BRB’s approach to identifying talented schoolchildren. Villa’s under-17s trained with BRB last year and Steve said it had already paid dividends, with three of the squad featuring in the England Under 17s team which won a top tournament in Portugal. Representatives from BRB visit 40 schools across the city every year to spot promise in Year One youngsters, as part of a scheme called Dance Track. “We look for focus and concentration, spatial awareness, flexibility – attributes that could be key for a promising footballer,” added Mr Chesterman. Mr Burns said Villa had learned from the scheme and planned to roll their own talent-spotting version out to more schools in September. “We have seen how they identify talent and thought it may be an avenue to pursue,” he said. Dressed in footless black tights and ballet shoes, the students could be dancing in any studio. But this one’s different than most: The pupils are all boys enrolled in Ballet for Boys Only, a new offering this year for Baltimore County students at Sudbrook Magnet Middle School, located off Bedford Road in Pikesville. The twice-weekly class was made possible, in part, by a $10,000 matching grant from the National Endowment of the Arts to the Baltimore County Youth Ballet, said Laura Dolid, a Reisterstown resident and the ballet company’s co-founder and artistic director. Nine county public schools students were awarded full-tuition scholarships to the ballet program, which is coordinated by the Greater Pikesville Recreation Council and runs from September to May. “This course will ultimately focus on the physical strength, power, and brilliance of male dancing,” said Dolid, who held auditions for the scholarships and chose recipients based on desire, musicality and parental enthusiasm. At the same time, it will increase the agility, coordination and strength required in sports, said the director, who is on the faculty at Sudbrook Arts Centre, Goucher College and Peabody Preparatory. Fox, who lives in Columbia, teaches two sessions back-to-back, one for students ages 11 to 14 and the other for ages 8 to 10. At no time was the absence of girls more obvious during a recent class than when Fox sent the three boys, ages 13 and 14, scurrying to the floor to attempt a split, a maneuver which is usually easier for female dancers. Fox is intimately familiar with what he’s demanding from the older boys. He performed with the New York City Ballet and elsewhere for many years before becoming an instructor. Aside from Sudbrook, he also is currently teaching at the Washington School of Ballet and the Maryland Youth Ballet and is an adjunct professor at Goucher College. Trés McMichael, a ninth-grader at George Washington Carver Center for Arts and Technology, said the class is “very hard” and students have to “stretch, practice and eat right” in order to be prepared for the workout they receive in class. But, that’s seems like a very small price to pay to Trés — who also acts, sings and plays tenor sax, and envisions himself on Broadway someday. “Mrs. Dolid runs a tight ship, which a successful program like this needs, and Mr. Tim puts the boys through a good combination of dance and physical training,” said Trés’ father, Calvin McMichael. “I knew that dance was very demanding, but I never realized how much technique and strength it takes to lift even the smallest dancers in the air. As the boys practice, Fox is right there to correct flaws in technique or form. But he also assumes a coach’s role during class, encouraging the older boys to complete sets of rigorous push-ups and chin-ups that bring to a close a demanding hour-long session. Scott Osbourne, an eighth-grader at Sudbrook and an Owings Mills resident, has been studying ballet for three years and hopes to someday join the New York City Ballet. But he also runs track, epitomizing the athletic crossover between dance and sports that Fox often sees. Monica Osbourne said her son has thrived under the program. Tamisha Bell, whose son is Sudbrook eighth-grader Damontae Hack, agrees. “Since starting dance, Damontae has become more efficient with his movements and his confidence has grown,” she said, adding that he will be auditioning for the dance magnet at Carver Center for Arts and Technology in January. A cello player who also enjoys acting, he’s set a goal of joining the Alvin Ailey American Dance Theater in New York. While stereotypes about boys as dancers have been changing for a long time, Fox said, television programs like “Dancing with the Stars” continue to reinforce newer, open-minded attitudes. The Baltimore County Youth Ballet will present its 20th annual production of “The Nutcracker Suite” on Sat., Dec. 17 at 7:30 p.m. and Sun., Dec. 18 at 3 p.m. at the Peggy and Yale Gordon Center for the Performing Arts, 3506 Gwynnbrook Ave. in Owings Mills. Students from the Ballet for Boys Only classes will participate in the show, which has a cast of young professionals and is geared toward children. Laura Dolid is staging and directing the production, which will also offer special matinees and pricing for school groups on Friday, Dec. 16. All tickets are reserved seating and cost $15. For more information, go to baltimorecountyyouthballet.com. 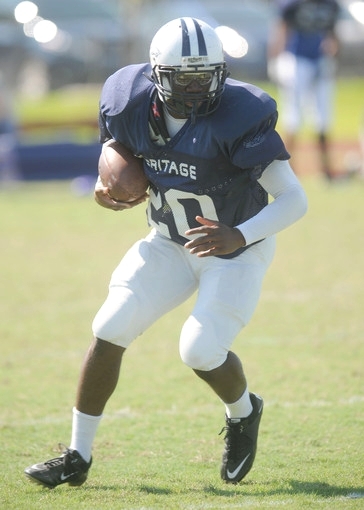 The days have become routine for Mike Wallace, but the American Heritage-Delray senior’s days are anything but typical. He’s at the bus stop by 7 a.m. so he can get to school, where he maintains a near-perfect GPA. He follows class with football practice. The difference between Wallace and other stellar student-athletes is what follows football practice. The intimidating 6-foot, 210-pound defensive lineman is a dancer — a great dancer. He’s an equally strong singer and actor. He’s the lead in the school’s December production of “Cats” and has won a cabinet of awards for his performances. And after football practice, it’s time for rehearsal. It’s a jam-packed day at school that eventually brings Wallace home around 9 p.m., when he is finally able to eat and start his homework. Most of Wallace’s days end in the early morning, and then he does it all over again. His coaches and teachers can’t explain it, either. He wants to continue to both dance and play football in college. He’s not sure he’ll get the opportunity. And if it comes down to choosing between the two, he’s not sure he can. In the meantime, Wallace goes from practicing with the petite girls in dance class to the 200-plus-pound boys for the highly ranked Stallions, and he doesn’t miss a beat in between. Wallace’s two, seemingly polar-opposite passions gave him detractors on the team, but it only took one run-in and a takedown of a senior football player to muzzle anyone who dared make fun of his showmanship. Wallace even serenaded the bully with a song. Wallace came to American Heritage to succeed in both his passions, and eight months from graduation, it’s clear that he has. 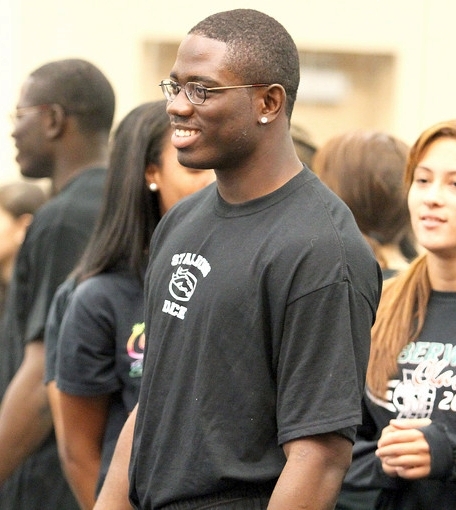 He transferred from Santaluces before the spring semester of his sophomore year. His brother-in-law thought it would be a better place for him to get a football scholarship, but Wallace was attracted to the school’s fine arts department. American Heritage tuition costs more than $20,000 annually, meaning Wallace had to qualify for a fine arts scholarship to attend. Despite not having even half the training of a typical scholarship recipient, he was allowed to audition. During the audition, Brad Tremper, the head of the fine arts department, declared that Wallace was the most talented kid he had ever seen and awarded him the scholarship. At first, balancing school, football and a full fine arts schedule was tough. Within a few weeks of starting Heritage, Wallace was overwhelmed and had frequent panic attacks. He was ready to quit the football team in the middle of spring practice. Wallace said it was a great relief to him that Tremper, who is also the Stallions’ running backs coach, and his other coaches supported his decision to do so, but in the end, Wallace didn’t quit. His passion for both football and dance was too strong. Wallace has turned down both Kentucky and New Mexico in hopes he can find a college where he can continue to excel in both of his passions. While he waits, he continues his extraordinary — routine — days.